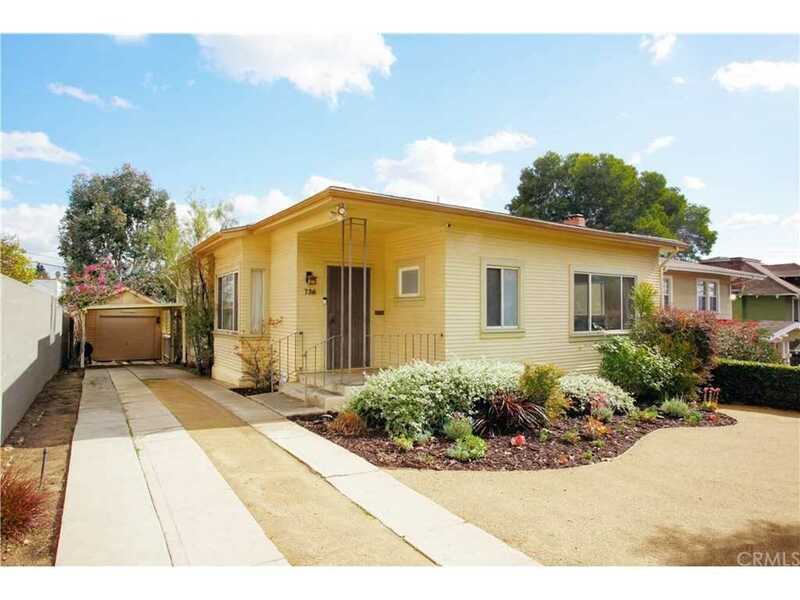 This La Fayette Park Place home in Silver Lake has been well-loved and has positive energy. As you enter the front door tons of natural light floods in. Notice the hardwood floors and high ceilings. Off the living room is the master suite with large panoramic windows perfect for beautiful views of the sunsets. The master has an en suite bathroom completely remodeled with white subway tile, frameless glass door, and extra large bathtub. Walking through the dining room is the kitchen which has a nostalgic feel, featuring a vintage O'Keefe & Merritt stove with pancake griddle. Standing in the sunroom and back bedroom you have beautiful views of downtown LA which is an 8-minute drive away, plus lush greenery and trees. The (2) auxiliary bedrooms have a completely remodeled bathroom with wainscoting of white subway tile carried into the shower, frameless glass shower door and floating sink. The newly landscaped large back garden is like a nature refuge, with a lush organic vegetable garden and drip irrigation. Original fixtures throughout the house have been updated to code and the home is well insulated, with a heating and air conditioning system. Silverlake has a great combination of picturesque nature, nightlife, and culture with great restaurants within walking distance. The reservoir is great for dog-walking and nearby-Griffith Park is great for hiking. This home and city have much to offer! Lot Size: 0.16 Acres / 6898 Sq. Ft.
SchoolsClick map icons below to view information for schools near 736 N La Fayette Park Place Silver Lake, CA 90026. Listing provided courtesy of Regina Hoffman, Palm Realty Boutique, Inc..
Home for sale at 736 N La Fayette Park Place Silver Lake, CA 90026. Description: The home at 736 N La Fayette Park Place Silver Lake, CA 90026 with the MLS Number SB19031697 is currently listed at $1,105,000 and has been on the Silver Lake market for 66 days. You are viewing the MLS property details of the home for sale at 736 N La Fayette Park Place Silver Lake, CA 90026, which includes 3 bedrooms, 2 bathrooms and has approximately 1266 sq.ft. of living area.